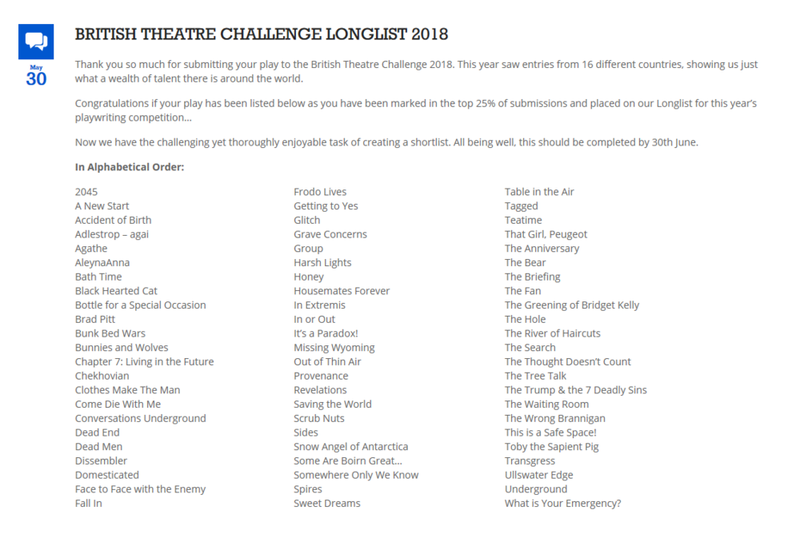 I'm pleased to announce that my newest short comedy, "In or Out", has been longlisted for the British Theatre Challenge 2018. The annual competition, organised by London-based Sky Blue Theatre Company, attracts entries from all over the world, and this year's longlist represents the top 25% of entries. At the end of the judging process in July, the five winning plays will not only be given a full performance at a London theatre, but also be considered for publication, filmed in performance by Mini Mammoth Films, and one lucky winner will see their play turned into a short film. There are filmed performances from previous years' competition winners freely available online, and they're well worth a look. The shortlist will be announced on 30th June.